Without clear explanation, Pitt relieved Jason Peters of his position as Pitt’s head wrestling coach Thursday. Peters no longer works for the University. Assistant head coaches Matt Kocher and Drew Headlee will act as co-head coaches for the remainder of the 2017 season. Senior 149-pounder Mikey Racciato did not wrestle against Franklin & Marshall, Davidson and Bloomsburg last Saturday, and Peters was not there to coach. The Pitt News has been looking into an incident that occurred during the team’s trip to Evanston, Illinois, for the Midlands Championships over winter break. The event involved police responding to a call within the hotel where the Pitt wrestling team was staying. Evanston Police Department Commander Joe Dugan shared details of an incident report from Dec. 31, stating that a 911 call came in from someone inside the Hilton Garden Inn at about 2:30 a.m. According to an employee at the hotel’s front desk, the Pitt wrestling team was staying at the Hilton Garden Inn at the time. The police responded to the call, and when they knocked on the hotel room’s door, a 22-year-old man answered, Dugan said. Police described the man as uncooperative, but he said one of his friend’s belongings — about $100 in U.S. currency — was stolen. The suspects were three black women whom the men had found on the website Backpage.com, according to the report. The Evanston Police Department did not release the names of the men in the room in time for publication but confirmed that they were there for a wrestling tournament. “It says they were in town for a wrestling tournament. It doesn’t mention if they’re in town to wrestle, to visit, to participate, as a viewer,” Dugan said. Another 19-year-old who was in the room, who said he was just a spectator, told police they had contacted the women via the Internet as a joke and that he left when the women arrived, Dugan said. The men did not want to pursue charges and did not want to talk further with the police. According to a source close to the team — who asked not to be named because they were not authorized to speak about the matter — Racciato and two other wrestlers along with Peters were suspended indefinitely prior to last Saturday’s matches. This source also said the wrestlers were asked to sign a confidentiality agreement Wednesday to not disclose information about the firing or suspensions. Pitt Athletics spokesperson Julie Jurich declined to comment on the incident in Evanston or whether the wrestlers had been suspended. “Whatever we put out today, that’s all we’ve got,” Jurich said, referring to the University’s press release announcing the coaching change on its official website. Pitt Athletics spokesperson E.J. Borghetti refused to comment on specifics of the Evanston report, but released an official University statement Thursday night. Racciato declined to comment without permission from Jurich. The other two wrestlers involved also declined comment. Peters had been the Panthers’ head coach since 2013 when he took over for longtime coach Rande Stottlemyer. He served under Stottlemyer as an assistant coach for 10 years, including nine as his top assistant. 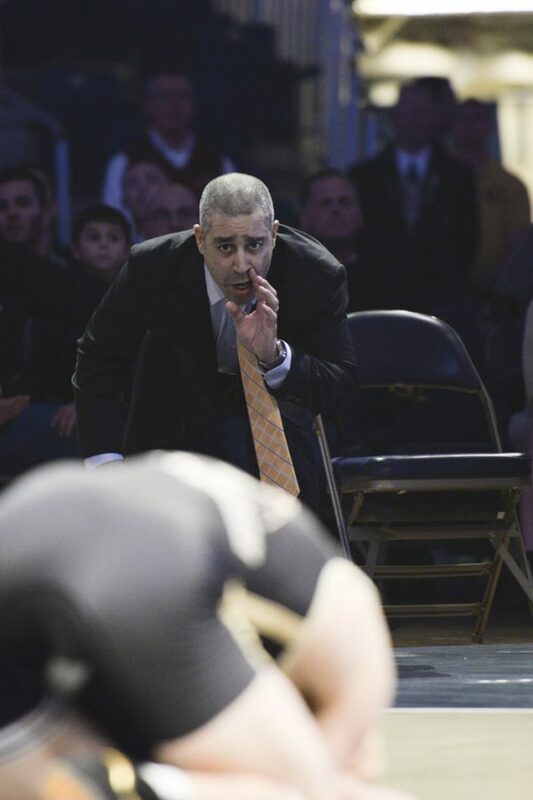 Prior to Pitt, Peters spent four years as head assistant wrestling coach at Princeton University as well as one season as an assistant coach at his alma mater, East Stroudsburg University. Elizabeth Lepro contributed to this report.